The University of Evansville’s Master of Science in Athletic Training (MSAT) Program has added two new opportunities to the already extensive immersive experiences that it offers its students. Those in the program can now also experience a clinical rotation with Vanderbilt University athletic teams and F. C. Dallas, Major League Soccer team. 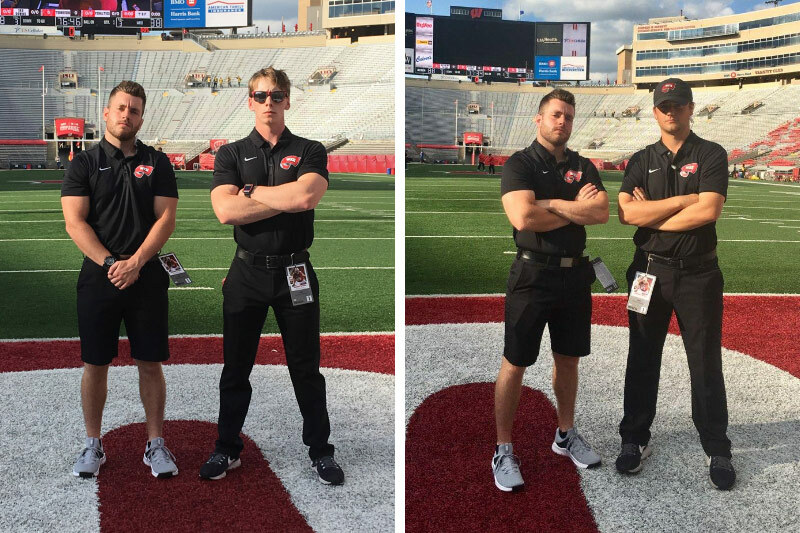 Students already have the opportunity to gain clinical experience by working with Western Kentucky University football and Northwestern University football, along with area high schools, universities, professional teams, and medical facilities. Immersive clinical experiences at institutions like these are invaluable to students, said Kathy Liu, UE’s MSAT program director. All MSAT students participate in an immersive clinical rotation. Classes taken during a student’s immersive semester are online. The student does not need to be on campus, so there are no geographic restrictions on the immersive rotations. Liu noted that the two new clinical experience partnerships offer unique advantages. 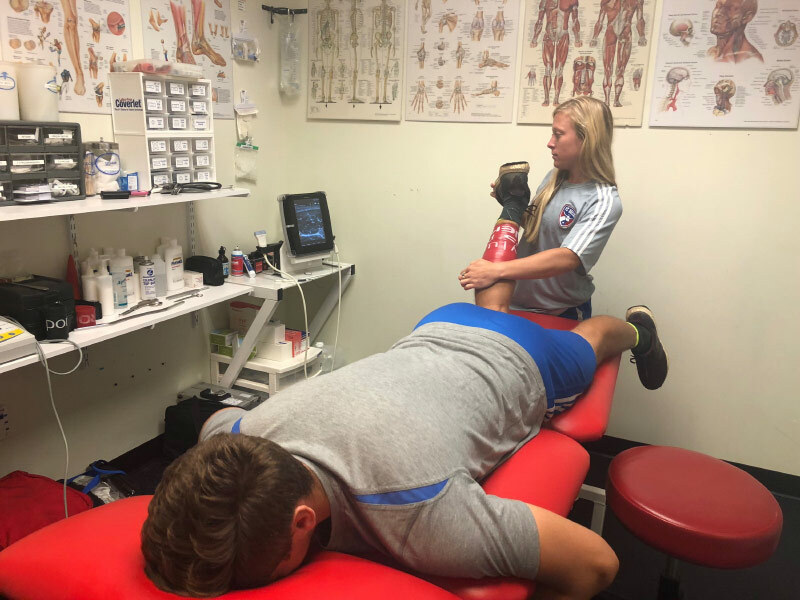 Partnering with FC Dallas gives UE’s athletic training program something that very few athletic training programs have – a major professional sports in-season clinical site. UE’s MSAT program has been producing successful clinicians for many years and will continue to do so far into the future, said Liu. Morgan Perry, recent 2018 graduate of the Master of Science in Athletic Training (MSAT) at the University of Evansville, won the research presentation award at the National Athletic Trainers’ Association (NATA) Convention last week. Being a finalist was a high distinction in itself, but Morgan represented UE impressively by winning the Master’s Research Presentation Award. Morgan’s abstract was a part of her graduate research work co-authored by research advisor Kathy Liu, UE professor and director of Masters of Science in Athletic Training Program; biostatistician William McConnell; and Dr. Geoff Gustavsen and professor Thomas Kaminski (both of the University of Delaware). Morgan has accepted a job as an athletic training intern at Alabama A&M and will be working with their football and track and field programs. Students in the University of Evansville’s Master of Science in Athletic Training Program will soon have clinical rotations with the Division I Football Bowl Subdivision teams at Northwestern University and Western Kentucky University. These full immersive clinical experiences are for second-year students and will begin in the fall of 2018. The UE MSAT program currently utilizes clinical sites at area high schools, universities, professional teams, and medical facilities. Students in the program also have opportunities to participate in research conducted in the University’s Dunigan Motion Analysis Lab. Students can work with faculty on faculty sponsored research projects or may perform their own projects. Students have presented their research findings at national meetings and in professional journals. The University of Evansville’s Master of Science in Athletic Training Program is one of 50 professional-level master’s programs in the country accredited by the Commission on Accreditation of Athletic Training Education (CAATE). UE is one of five institutions in the nation that have concurrently running accredited master's and a bachelor’s Athletic Training Programs. The University of Evansville’s Professional Athletic Training Program has been granted five-year accreditation by the Commission on Accreditation of Athletic Training Education (CAATE) with the next comprehensive review occurring during the 2021-22 academic year. UE hosted a site visit with a CAATE review team in January 2017 after an intense period of self-study, which began in the fall of 2015, and a self-study application that was submitted June 1, 2016. The site visit team reviewed extensive reports and interviewed members of the athletic training team to evaluate and verify the institution’s ongoing ability to meet the standards for accreditation. The athletic training program is now one of only five schools in the country that has an accredited program at both the master’s level and bachelor’s level, giving students options for pursuing their athletic training degrees. The University of Evansville student athletic trainers of the class of 2014 presented an Automated External Defibrillator, or AED, to the Tecumseh High School athletic trainers at the school’s football game on Friday, October 17. According to the American Red Cross, “Sudden cardiac arrest is one of the leading causes of death in the U.S. Over 350,000 people will suffer from sudden cardiac arrest this year. It can happen to anyone, anytime, anywhere and at any age. An AED is the only effective treatment for restoring a regular heart rhythm during a sudden cardiac arrest. The average response time in the U.S. for first responders once 911 is called is eight to 12 minutes. For each minute defibrillation is delayed, the chance of survival is reduced approximately 10 percent”. The University of Evansville graduates began raising funds in the spring to help purchase an AED for local high school athletic trainers. As part of the National Athletic Trainers’ Association Safe Schools Program, the goal is for all high school athletic trainers to have access to this important device. “Tecumseh is just the first to receive an AED, as the University hopes to become a central hub that area high schools can rely on for services, information, and products to become a Safe Sport School”, says Jeff Tilly, athletic training program director at UE. UE athletic training graduates who presented the award included Katrina Kain, Sophia Pollalis, Catlin Harty, and Brittany Sheffield. Haley Campbell also participated in the project. Also accepting the award for Tecumseh High School were athletic trainers Tim Nurrenbern and Sue Laughbaum. Nurrenbern and Laughbaum noted that the UE class of 2014 should be congratulated for having a perfect pass rate on the Athletic Training Certification Exam. The class is 12 for 12 this year, which is a great accomplishment that speaks highly of the program and of the students in the program.